Some 44,000 Native Americans served in the U.S. mili­tary during World War II. There were one-and-a-half times more Native Ameri­can volun­teers than draftees; indeed, Native Amer­i­can parti­ci­pa­tion in the war per capita ex­ceeded any other group. Native Amer­i­cans served in all theaters, but pre­domi­nately in the Pacific. No group of Native Amer­ic­ans has received as much fame as those from the Navajo Nation. Navajo Code Talkers played a pivotal role in every success­ful engage­ment against the enemy in the Pacific, from Guadal­canal to Oki­nawa. Because Navajo Code Talkers were them­selves the secret code of U.S. Marines, these men—former farmers and sheep­herders in the U.S. South­west—were highly prized and often heavily guarded. From the original 29 code talkers in 1942 who devel­oped their in­genious “secret wea­pon”—their 411‑word vocabu­lary in their native Dine tongue—at least 400 young Navajos trained as code talkers. The coded oral mes­sages they passed between them­selves were totally unin­tel­ligible to any­one else; in fact, their code was the first un­break­able code in U. S. history. In the Battle of Sai­pan (June 15 to July 9, 1944), a Navajo Code Talker con­vinced a U.S. artil­lery unit in the rear that theirs was not a Japa­nese posi­tion on which Amer­i­can shells were raining (“friendly fire”) but an Amer­i­can one: eaves­dropping Japa­nese had learned to per­fectly imi­tate Amer­i­can radio commu­ni­cation between units except when it was in Navajo (Dine). During the Battle of Iwo Jima (Febru­ary and March 1945), six code talkers sent and received 800 field mes­sages working 24/7. During the war 13 Navajo Code Talkers were killed in action. After the war code talkers were forbid­den to speak of their ser­vice until 1968, when the Code Talker Opera­tion was was finally declas­si­fied. Code talkers received wide public recog­ni­tion when Presi­dent Ronald Reagan desig­nated this date in 1982—the 37th anni­ver­sary of Japan’s uncon­di­tional sur­render—as National Code Talkers Day. In July 2001 the original 29 Navajo Code Talkers were awarded the Con­gres­sional Gold Medal. On Novem­ber 15, 2008, the Code Talkers Recog­nition Act of 2008 was signed into law by Presi­dent George W. Bush. The act recog­nized every Native Amer­i­can code talker who served in the U.S. military during both world wars with the exception of the already-awarded Navajo. Each nation was given a Con­gres­sional Gold Medal, to be retained by the Smith­sonian Insti­tut­ion, and a silver medal duplicate was given to each code talker. 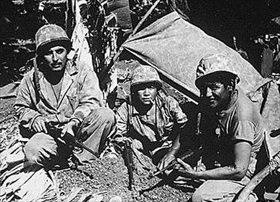 Left: Navajo Code Talkers, Saipan, June 1944. Code talkers are strongly asso­ci­ated with bilin­gual Navajo speakers spe­cially recruited by the U.S. Marine Corps to serve in their stan­dard com­mu­ni­cations units in the Pacific Theater. The Navajos’ lan­guage, Dine, has an elabo­rate syn­tax and gram­mar, and the spoken word uses tones the un­trained ear can­not easily distin­guish. So the code the original 29 Navajo Code Talkers developed befuddled the Japanese all during the war. Actually, Choc­taw Indians serving in the U.S. Army in France during World War I pio­neered code talking. Other Native Amer­i­can code talkers were deployed by the Army during World War II, including Chero­kee (Euro­pean and Pacif­ic thea­ters), Choc­taw (Euro­pean Thea­ter), Lakota, Mes­kwaki (North African Thea­ter), and Coman­che (Euro­pean Theater) speakers. The Marines employed Basque speakers whose lan­guage is spoken in north-central Spain and south­western France for code talking in areas where other Basque speakers were not expected to be operating (Hawaii and Australia). 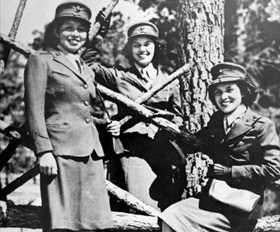 Right: Native American women as Marine Corps Reservists at Camp Lejeune, North Caro­lina, Octo­ber 16, 1943. The three women represent the Black­feet, Potawatomi, and Ojibwe nations. 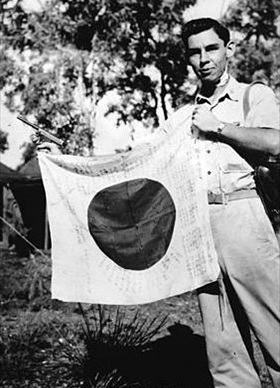 Left: Lt. Woody J. Cochran holds a Japanese flag, New Guinea, April 1, 1943. A Chero­kee from Okla­homa and a bomber pilot, Coch­ran earned the Silver Star, Purple Heart, Distin­guished Flying Cross, and Air Medal. Right: Cpl. Ira Hayes was a Pima Native Amer­i­can from Cen­tral Ari­zona. At age 19, he is shown in this photo at the Marine Corps Para­troop School at Camp Gillespie near San Diego, Cali­for­nia, in 1943. 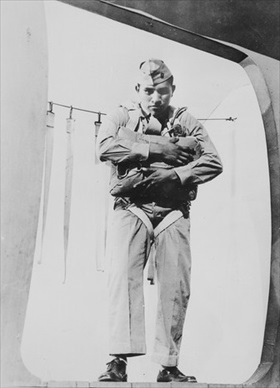 Hayes fought in the Paci­fic Theater and is best known for helping raise an Amer­i­can flag and flag­staff over Mount Suri­bachi on Iwo Jima on Febru­ary 23, 1945, an event famously photo­graphed by Joe Rosen­thal of the Associated Press. President George W. Bush Honors 29 Original Navajo Code Talkers, July 26, 2001, in Washington, D.C.